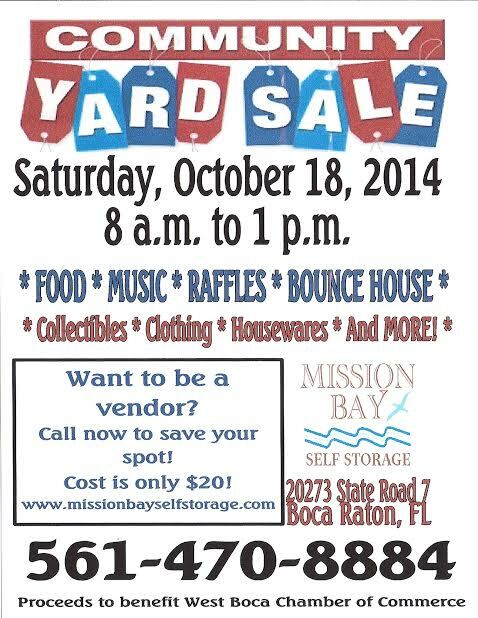 Mission Bay Self Storage will be hosting it’s second Multi-Family Community Yard Sale on Saturday, October 18th from 8am-1pm at 20273 State Rd 7 in Boca Raton. In addition to old family treasures, the event will offer food, music and a bounce house for some family fun. Last February, this event brought out about 40 individual families to sell there goods and about 400 shoppers. Due to the large crowd, there will be no vehicle access permitted on the property starting at 7:45am until 1pm that day. If you think you will need items from storage that day, please plan ahead accordingly. If you have a vehicle or boat that you will need access to during the yard sale, please call the office immediately for alternate arrangement options. All proceeds from food a space sales will benefit the West Boca Chamber of Commerce. To reserve your own vendor table, you may call the number below. Cost is $20 to reserve.